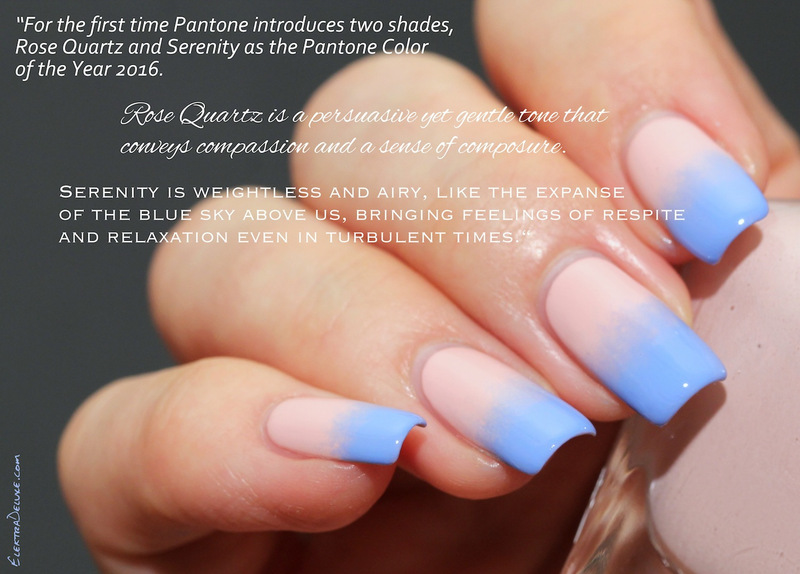 Let me present you the new Color of the Year 2016, recently announced by Pantone: the blend of ROSE QUARTZ & SERENITY! 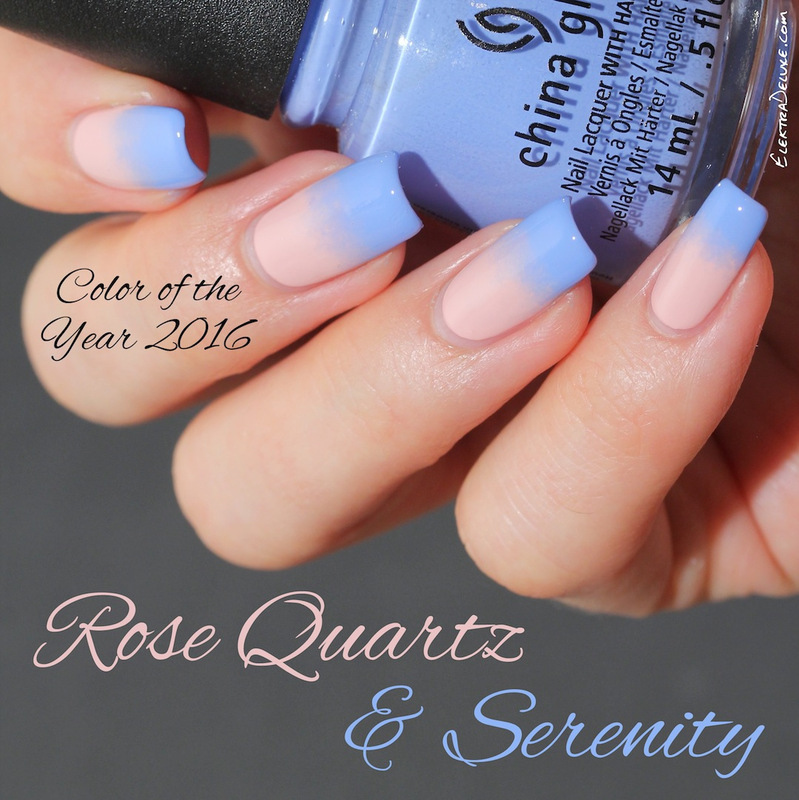 Rose Quartz is a gorgeous warm pastel pink and Serenity a soft periwinkle. Let’s see Pantone’s reasoning for this choice! Let’s take a closer look at Rose Quartz! I browsed my stash for matching colors and here they are. The polish that is most accurate is Sally Hansen Pinky Promise, which I’m wearing on my ring finger. It is a creme and I needed 3 coats for full opacity, but I think you can get away with 2. If you prefer a jelly finish, I recommend OPI Put It In Neutral (pinkie). It was part of this year’s Soft Shade Collection. This polish is not meant to be worn opaque and the great thing is, it is already perfectly even on the first coat. I applied 3 coats for the picture. 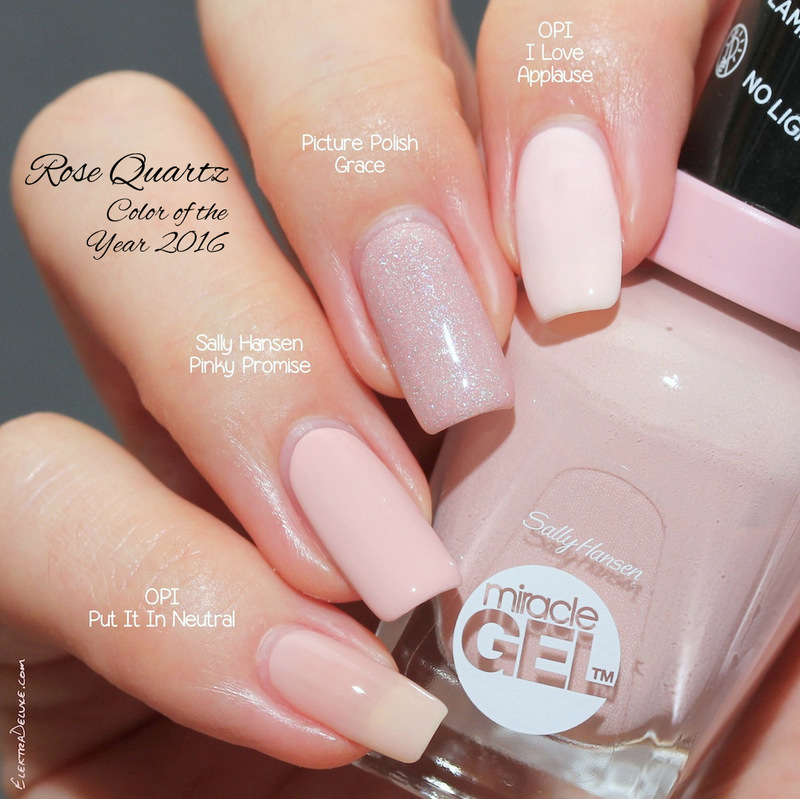 OPI I Love Applause on my index finger is a crelly and a very light version of Rose Quartz. I’m not the biggest fan of this polish, because while I managed to get it kind of opaque, it still looked a tiny bit splotchy in real life. And finally on my middle finger is my favorite: Picture Polish Grace! It is a gorgeous light pink infused with scattered holo particles. You’re looking at 2 flawless coats. 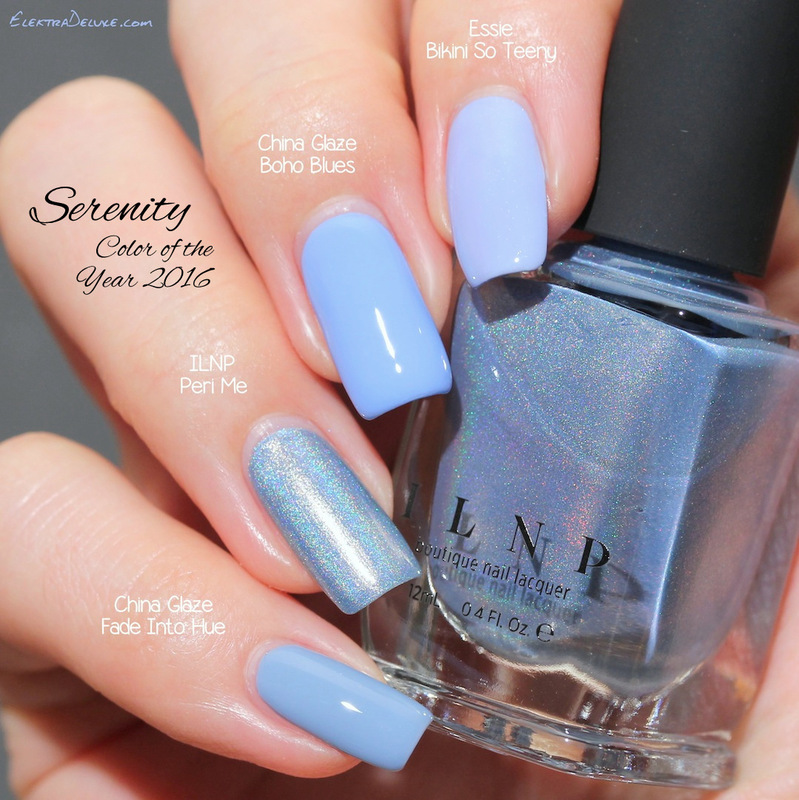 As I said in the beginning, Serenity is pretty much a true periwinkle (feel free to check out my Periwinkle Spring Special for an in-depth color overview!). Those are the four shades from my collection, that match Serenity the best: On my index finger I’m wearing Essie Bikini So Teeny (2 coats). It has a slight lilac undertone and a very subtle shimmer. More blue and also more vivid is the creme polish China Glaze Boho Blues on my middle finger. It was part of the Road Trip Collection and I included it in my Top 5 Spring Polishes 2015. I needed 3 coats for even coverage. A little bit more muted is China Glaze Fade Into Hue on my pinkie. It is also a creme but has a better formula than Boho Blues. I applied 2 smooth coats. It belongs to the Avant Garden Collection from three years ago. Finally we have the show stopper on my ring finger: ILNP Peri Me, a periwinkle holographic. I go crazy for this polish! Formula is also great. This is 2 coats. Apart from being a grammatical nightmare, the concept of choosing two colors as color of the year is just odd. I wish Pantone wouldn’t have done that. I get that Pantone apparently wants to implement something fancy but this weird approach is just not the way to do it. Wasn’t everyone happy with ONE color as color of the year, as it logically should be? I know I was! What’s your take on it? 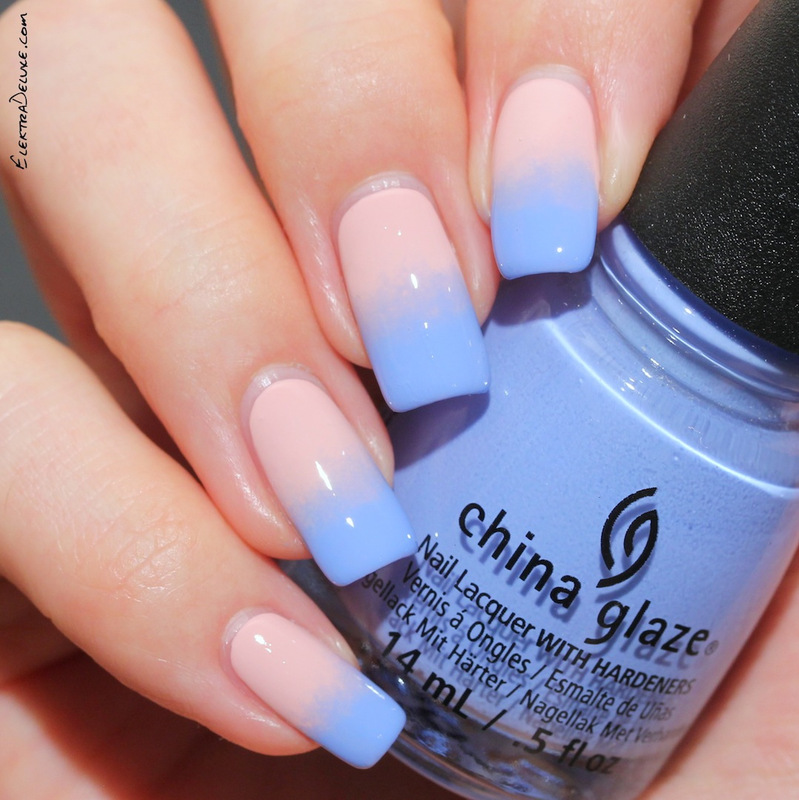 And do you like Rose Quartz and Serenity?